Dogs are the most delightful companions for a random cruise with your car, they often make all kinds of gestures when confined in car spaces, defensively barking at potential intruders when you park your car to quickly grab an ice cream, and they even sing along with you to your favorite song on the radio. However, it can be quite a drag cleaning up after the little cruise around the neighborhood as dogs often make quite a mess especially when they are on their shedding season. I mean, no one likes a backseat layered with dog fur and the natural canine odor. Here are a few tips to keep your car clean even after jolly rides with man’s best friend. Dogs often shed their fur seasonally and it could turn out to be a disaster if they are allowed to walk all over your leather seats without proper brushing. So what do you do about this? Grooming of course; trimming and combing your pet with a proper canine groom kit will ensure that fur droppings are significantly reduced. Dog seat covers come in different materials and sizes, and they are strong and durable. One might wonder why you need a dog seat cover when your leather seats are quite easy to clean. The problem is that dogs can be quite playful and tend to scratch at the seats, causing lines, cuts and tears. Aha! You didn’t think of that did you? These durable covers protect your seats from scratches, fur balls, and other gross droppings that canines may be capable of. ​There are lots of upsides to dressing your dog up for a cruise in your car. Firstly, your dog will look absolutely adorable and will fetch you a lot of glances lastly, it will help hold or trap loose fur, stopping them from littering all over your seats and carpet. Some people go the extra mile of providing dog shoes to stop their dogs from scratching the interior; this is definitely a smart move. ​Mini portable dog vacuum cleaners are highly efficient and can remove pet fur from car seats, carpets, and from very tight spaces in the car that may be difficult to reach. Vacuuming may also be made easy with a brush which can help you brush off attached fur before using the vacuum. ​You can easily eliminate canine odor by using air fresheners. You may slightly sprinkle on upholstery or perhaps attach the solid type close to the air conditioning. Properly ventilate your car as well to completely remove smell. ​Dogs can come up with surprises sometimes and there is a need to be absolutely prepared for whatever comes next. Whether vomit, fur, or dog-drool, the rubber floor mat is built to protect your car floor from anything. The rubber mats are durable, strong, and can easily be maintained by washing as regularly as they are used, with water. ​Ever come across a vehicle on the road with a giant dog at the back seat, looking out the window with its tongue out, catching the wind? If you haven’t, it’s absolutely adorable to watch, and if you have, then you know that there are consequences for the vehicle owner. The window is often covered with smudges and dog-drool. You can keep this in check by securing your window with window wraps. Well, it’s either this or be prepared to do a quick clean after the drop-off. 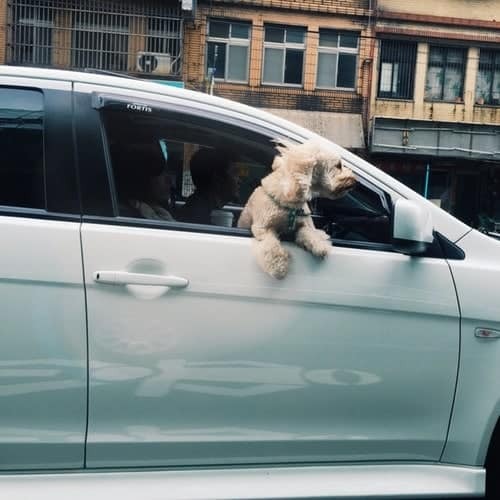 Yes, dogs enjoy a good car ride and they are also great companions to ride with but if we want that nice leather seat living out its warranty or need our car smelling nice all the time then we have to take these precautions.